One hundred and fifty years after the U.S.-Dakota War of 1862, the story of the Dakota Indian people is still connected to a troubled history of broken treaties and brutal repression that followed the war. But there is another deeper and older history: That of the Dakota people and their connection to the land of “Mni Sota Makoce,” the place where the water reflects the clouds in the sky. Minnesota is a Dakota place. The confluence of the Minnesota and the Mississippi Rivers below Fort Snelling is called B’dote (early white settlers transformed the word into “Mendota”) — the place where the Dakota believe they emerged into the world. It is one of their creation stories. 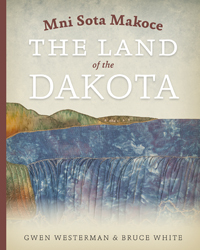 All over the landscape, the Dakota people left their mark and preserved their history, yet most of them were exiled from this place — Mni Sota Makoce: The Land of the Dakota, which is also the title of a new book researched and written by Dakota scholar and educator Gwen Westerman and by historian Bruce White. The pair set out to reclaim the land and its true history through their book, which is a finalist for honors in the 2013 Minnesota Book Awards. All one needs to do is look around. For people in Minneapolis, Lake Calhoun is a popular spot to inline skate, jog and enjoy an afternoon picnic. But the lake’s true cultural history remains hidden from view. It’s original name, Bde Maka Ska , means White Banks Lake in Dakota. It was the site of a Dakota village in the 1820′s and 30′s. Wild rice was harvested, fish were plentiful and small gardens fed the people who chose it as their home. The village belonged to Cloud Man or Mahpiya Wicasta, one of the first Dakota to try the white man’s way of farming. He came from Black Dog’s village in what is now known as South St. Paul. The only trace of his once-prominent village that remains is a small plaque on the eastern shore line of the lake. Another favorite spot in Minnesota also has its origin in the Dakota way of life. On the St. Croix River, in the town of Afton, pontoon boaters can be seen kicking back on warm afternoons. It’s original name is Hogan Wanke Kin, or Where the Fish Lies. According to stories told to explorers Pierre Le Sueur and Jonathan Carver in the 1700′s by both Ojibwe and Dakota, two young men transformed themselves: One into a fish, the other a sandbar. Another story published in the Dakota Friend, a series of articles written by missionary Samuel Pond, tells of two Dakota hunters traveling together who could eat only flesh that had not touched water. Even though they were hungry, they wouldn’t eat even a crane because the bird’s legs had touched water. Finally, one of the hunters became too hungry to resist eating a fish. It made him very thirsty and he drank and drank so much water that he lay down and turned into a fish himself. This according to the author, is the origin of the sand bar that stretches across the river. Although Mni Sota Makoce stays away from the events of the U.S.- Dakota war of 1862, it does not shy away from the catastrophic results of the war and its conflicts, the loss of Dakota culture and language. The book features three versions of the Treaty of 1851. Called the Treaty of Traverse des Sioux, it effectively removed the Dakota from their land, forcing them onto reservations and leading to the war of 1862. One such version is a never-before-seen Dakota translation of the treaty by Glenn Wasicuna, Westerman’s husband. According to the treaty journal, the treaty was ordered to be read aloud to the Dakota by a missionary named Stephen R. Riggs. Riggs faced many challenges in translating what was essentially an oral language into Christian concepts of ownership and money. Simple nuances in each language were difficult. Sometimes Riggs omitted them altogether. For instance, a passage that dealt with payment for the land In article 4: It states that $136,000,000 would “remain in trust with the United States, and five per cent interest thereon to be paid annually, to said Indians for the period of fifty years…which shall be in full payment of said balance.” In effect, that meant that the principal would never be paid to term, but that passage was simply omitted in the Dakota-language version. After the US-Dakota War of 1862, 38 Dakota men were hanged in the largest mass execution in US history. Many believe the execution was also one of the largest miscarriages of justice in the nation's history. Today, Representative Dean Urdahl hopes to "rub a little salve in the wound" by seeking a pardon for one of the executed warriors. His name was Chaska.